Hi I'm Chris Shattuck with Build a Module dot Com, and in this video I'm going to show you how to apply for a CVS account and give you some tips and tricks as you go through the application process. First of all, we're going to talk about what you do before you apply; there's actually quite a few steps that you should take before you submit that application and I want to go through those in detail. Next, I'm going to talk about the application process; what happens when you apply and after you apply. Finally, I'll post a list of helpful links that I refer to in this presentation so you can copy those down for later. Okay. Let's get started. The first thing I want t you to do before you apply for a CVS account is take a deep breath; this is a point at which your Code your Coding styles and your motivations are going to receive the most criticism and it attention at probably any point during your development. There's a really good reason for this, and that's that the community needs a filtering system to make sure that new Code that's being added to Drupal follows particular Coding standards and that they're maintained in a responsible way. So, it's important that you come across as responsible as possible and you can do that by following a few pretty simple rules but that might require just a bit of time to wrap your mind around it if you're not used to that already. So, here's a list of things I want you to do before you apply for you CVS account. Go ahead and read about Drupal Coding Standards; here's the URL its Drupal dot org dash Coding dash Standards. There's standards for things from 'if-then' structures to 'white space' to the structure of your Code and commenting it. Do everything you can to make sure that you follow in these Coding standards because if someone's reviewing your code and they see some blatant errors in this standards, this is going to be a huge red flag and they're going to stop right there before they even evaluate the rest of your Code. Next, it's important to understand some security basics, so there's a good handbook page on Drupal dot org called Writing Secure Code. You can also take a look at my videos on Build a Module dot com; I have a set of four that covers the most common Functions used to implement security in your Code. 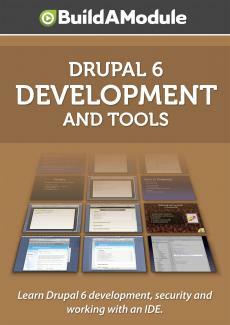 You can also read a book by Greg Knaddison called Cracking Drupal, which is a great book. What reviewers will do is take a look and see if the Functions that are mentioned in both the Security handbook and in my videos, that they're actually being used somewhere in the Code; they're not necessary look at how but the important part is that there in there. So, if there's no mention of particular Functions that are very security focused in your Code, that's also going to be a red flag, and that's' going to stop the submission right there, and they're going to ask you to review your Code. Next, before you get into the process of actually writing your Module, it's important to make sure that the functionality that you're trying to achieve is not already being achieve by an existing Module; because the repository of Drupal contributions is so vast, it's important to talk to a few people and get people's opinions. Ask them if this is a good idea if there's existing Module that does this similar, or the same thing; then you can review those Modules, install them, make sure that what you're hoping to achieve is actually unique and different. So, a good quote from this CVS application handbook page is that your Modular theme should demonstrate ingenuity and originality. If you're just duplicating existing Modules, that's not going to be a pass for your application because the Drupal community wants to see effort being consolidated on single Modules if they provide the same functionality. Both for the Users of Drupal because it reduces confusion and also to make sure that the energy of the Drupal name maintainers it is captured in a good way and not duplicated or forked. Next, go ahead and read some other CVS applications out there; so, whenever somebody applies for a CVS application, an issue gets created on projects slash issues slash CVS applications.